KitCore, Drum/Percussion Sample from Submersible Music. Submersible Music has released the new 2.0 version (v2.0) of KitCore and KitCore Deluxe, the AU/VSTi/RTAS MIDI drum instrument and groove library for Mac® and PC. These tools offer songwriters grooves by famous drummers/percussionists plus their acoustic, electronic and Latin instrument sounds at a low price. Plus users can mix and match any of the 48 pad sounds to create their own custom, hybrid kits. The v2.0 upgrade is FREE to all KitCore and KitCore Deluxe version 1.0 owners now at submersiblemusic.com. Now you can easily search and audition your KitCore grooves using the new Groove Browser. Beats, variations and fills are arranged into song-like GrooveSets for easy access by songwriters. Search for content based on drummer, musical style and "Feel" criteria (like shuffle, swing, 1/8th, 1/16th etc.). Then simply drag and drop the grooves to a track in your host application (Acid, Cubase, DP, GarageBand, Live, Logic, Pro Tools, Sonar, etc.). 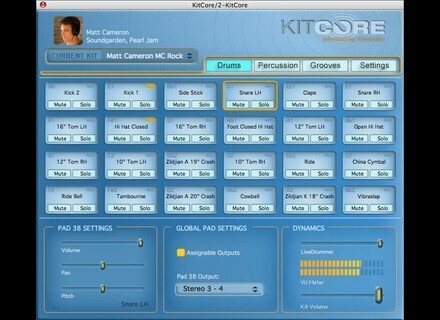 Enhancements to the KitCore MIDI engine provide greater realism for drum rolls and cymbal performances. Tired of "machine gun" playback? Grab the LiveDrummer slider and bring the dynamics back into your groove! New for v2.0, are drumkits and grooves from Seattle rock/alternative legend Matt Cameron (Soundgarden, Pearl Jam) and noted metal drummer John Tempesta (Rob Zombie, Testament, Helmet). This new content will be available as a free KitPack download for KitCore Deluxe users. KitCore and KitCore Deluxe include KitCore™, the MIDI drum instrument and groove library based on the award-winning DrumCore product. KitCore allows MIDI-based musicians (on both Mac® and PC) easy access to the same MIDI drumkit/percussion sounds and MIDI grooves of famous drummers found in DrumCore at an ultra-affordable price. KitCore works with all RTAS (Pro Tools®), AU (Logic, Garageband, DP®, Live™, Tracktion™) and VSTi (Acid®, Cubase®, Sonar™, Band-in-a-Box™) plug-in hosts and is GM compatible. KitCore and KitCore Deluxe give easy access to drumkits (acoustic and electronic), Latin percussion sounds and grooves by hit-proven players. 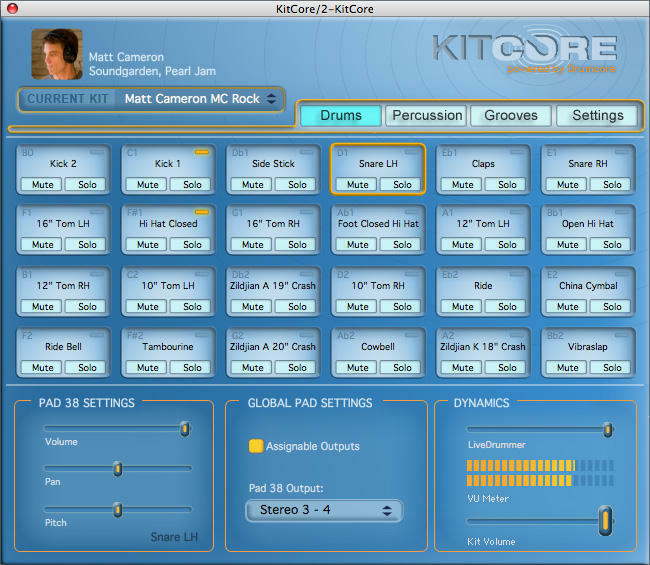 KitCore includes 8 drumkits and over 400 MIDI files. KitCore Deluxe offers over 100 drumkits and over 3,000 MIDI files. Content is available by Ben Smith (Heart), John Bishop (Ernie Watts), Terry Bozzio (Jeff Beck, Frank Zappa). Matt Sorum (Velvet Revolver), Tony Braunagel (Bonnie Raitt), Ned Douglas (Dave Stewart , Sly Dunbar (Bob Marley), Michael Shrieve (Santana), Alan White (John Lennon, Yes), Lonnie Wilson (Brooks & Dunn, Rascal Flatts), Zoro (Lenny Kravitz) and others. More content is available via inexpensive "KitPacks". Upgrades and new versions of KitCore ($49 USD) and KitCore Deluxe ($99 USD) version 2.0 are available now via the Submersible music website and music software resellers worldwide. Customers can buy version 1.0 with confidence, as the v2.0 upgrade is a free download. Example drum tracks can found on the Submersible website when visiting the KitCore product pages. For more information, visit their web site at www.submersiblemusic.com. ModernBeats Tribal Xplosion Loops 1 ModernBeats Releases Tribal Xplosion Loops. ModernBeats Xtreme Synth Loops 1 ModernBeats Releases Xtreme Synth Loops featuring 200 mix-matching hip hop synth loops.